Today’s jewelers have access to an astounding variety of metals in different colors. While options such as platinum and palladium are becoming more popular, gold is always a fantastic choice. Learning about the differences between yellow gold vs. rose gold vs. white gold rings is a great way to narrow down your options when deciding which metal to choose for the jewelry that ultimately represents the love in your life. Here, we take a closer look at different types of gold with the goal of helping you to make a well-informed decision. While we often think of yellow gold as being pure, the yellow gold used for rings is an alloy made by combining pure gold with metals such as zinc and copper. As with other gold colors, the higher the karat amount, the higher the actual gold content, but the less durable the piece of jewelry is. 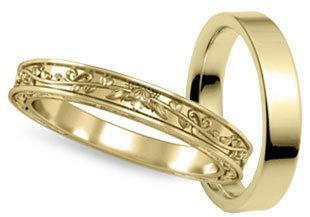 Therefore, 18K or 14K gold is used for wedding and engagement rings. This gives them a beautiful golden hue while helping them to stand up against the demands of everyday wear. Yellow gold looks nice on anyone, but is particularly beautiful when contrasted with olive and darker skin tones. It looks less impressive on pale to rose skin tones, meaning white or rose gold might be a better choice for someone with fair skin. 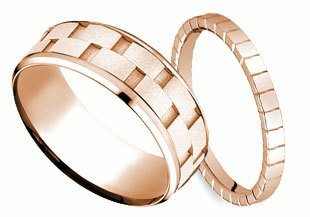 Some other considerations to keep in mind when comparing yellow gold with rose gold and white gold is that yellow gold, particularly high-karat yellow gold, can be easily scratched and dented. It needs to be cleaned and polished regularly. Need advice on selecting a color? Call 866-737-0754 to speak with a jewelry expert for guidance. Yellow gold ring settings look fantastic for all kinds of wedding and engagement rings, and make a lovely choice for modern and vintage-inspired styles. It is historically the most popular metal for wedding and engagement rings, and as it is the most malleable, or easiest for jewelers to manipulate, it is also a good choice for rings that may have to be resized at a later date. The main difference between yellow gold and white gold is that white gold is an alloy of gold and a white metal such as palladium, manganese, or nickel. Like yellow gold, white gold’s purity is defined in karats. White gold rings often contain nickel, which provides the strength needed for a durable setting that lasts. If you like the look of platinum but want to spend a little less, white gold is a fantastic choice. When comparing white gold vs. yellow gold, white gold is stronger and more durable, meaning it is less susceptible to scratching and denting. Like all precious metals used for rings, white gold requires some maintenance. Cleaning and polishing is a must, and this metal needs to be dipped every few years in order to retain luster and color. This service is inexpensive; in fact, many jewelers offer it for free. On the downside, white gold that contains nickel can cause allergic reactions in some people with sensitive skin. If you have a nickel allergy and want to wear white gold, you will need to choose jewelry made with a nickel-free alloy. White gold has a cool, sophisticated gleam. When you look at white gold vs. rose gold and yellow gold, you’ll find that it looks nice with all skin tones, but is particularly complementary to fair and rosy skin tones. If you are looking for rings that complement olive or darker skin tones, consider yellow gold or rose gold. Next, let’s take a look at rose gold vs. yellow gold vs. white gold. Rose gold is a gold and copper alloy that is sometimes referred to as red gold or pink gold. As it was popular in Russia at the turn of the nineteenth century, was once commonly referred to as Russian Gold, although the term is rarely heard these days. Like yellow gold and white gold, rose gold is a very popular choice for jewelry. 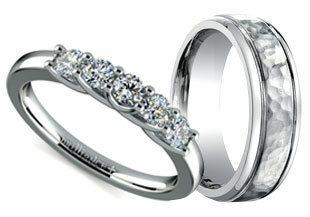 Though it is seen less often, it is gaining popularity, particularly among people who want their wedding and engagement rings to have a unique, romantic look. Rose gold works well in all types of settings but is particularly appealing in vintage-inspired engagement rings and wedding rings. It can be combined with white or yellow gold to create a unique multi-colored setting that appeals to the wearer’s artistic side. Durability is another consideration to keep in mind when comparing rose gold vs. yellow gold vs. white gold. Incredibly, this softly romantic colored gold is the strongest of the three, as copper is very sturdy and the resulting alloy is tougher than yellow or white gold. On the downside, copper can cause allergic reactions in some individuals, and is not considered to be a hypo-allergenic metal. If shopping for someone with very sensitive skin, yellow gold may be your best choice. If her style leans toward classic or vintage looks, she may prefer rose or yellow gold. Now that you know the basics concerning white gold vs. yellow gold vs. rose gold, there are a few other things to consider before beginning the actual process of shopping for wedding rings or an engagement ring. Type of jewelry recipient prefers – Some people simply prefer the look of one type of metal over another. If a woman has a tendency to wear a lot of white gold, for example, it is likely that she will appreciate a white gold engagement ring over one in rose or yellow gold. If she likes to mix things up with different colored jewelry, a ring that combines different colors might be in order. Recipients Lifestyle – Women with very active lifestyles often prefer jewelry that offers some durability. Remember that white gold and rose gold are strongest, while yellow gold is most susceptible to scratches, dings, and dents. Recipient’s Sense of Style – If the ring’s wearer is always on trend, it’s likely that she will appreciate a ring in white gold rather than rose or yellow gold, as this is the most popular color. On the other hand, if her style leans toward classic or vintage looks, she may prefer rose or yellow gold. Type of Stones – If you are going with white diamonds, you’ll find they look lovely in setting made with all three types of gold. Fancy colored diamonds and colored stones often look best in rose or yellow gold settings, although some, such as sapphires, look absolutely magnificent in white gold settings. Price – Finally, price is a consideration. Regardless of budget, you really do want to get the best quality you can afford. As it turns out, yellow, white and rose gold have their pros and cons, and all are available in affordable settings. Yellow gold vs. white gold prices vary by actual gold content, as do white gold vs. rose gold prices. Armed with the details we’ve provided, you’ll find it is easier to make a well-informed decision. Whether you prefer white, yellow, or rose gold, you’ll find all types at Brilliance, where engagement rings and wedding rings are our specialty. With incredible pre-set options plus a free interactive tool for designing your own custom wedding and engagement rings, you’ll find that comparing different styles and gold colors is fun and simple, with options to suit every budget.